"I told my Team the first week: What I'm doing is bigger than getting you through high school. I want to see you graduate, but I'm here to set you up for life. I'm going to work with you, and if we never win a basketball game, I don't care. The sports are secondary." 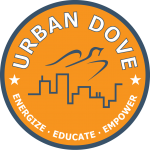 Urban Dove is fortunate to have an amazing and dedicated group of stakeholders that all share a common goal – helping our young people succeed. From the Board of Directors to the staff to the volunteers, parents, families, alumni and students, each member of the UD family makes our program stronger and more impactful.